Davis Vibration Consultants is the foremost independent authority in transportable balancing machines and low speed balancing. 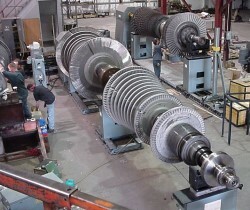 We specialize in field balancing of large rotating machinery and have clients throughout the world. We manufacture and sell balancing machines; and can service or refurbish your balancing machine to upgrade its capabilities to meet current standards. We provide other field services such as vibration analysis, laser alignment, thermal imaging, and training. Additional details on our quality services and products are provided on this website. Please contact us to discuss your requirements.